FAIRFAX, VA – November 12, 2018 – Sightline Systems today announced the North American launch of a global manufacturing analytics solution in partnership with Sightline Japan and NEC Corporation to leverage artificial intelligence to collect, analyze and visualize Industrial Internet of Things (IIoT) data to address the Industry 4.0 priorities of today’s smart manufacturers. 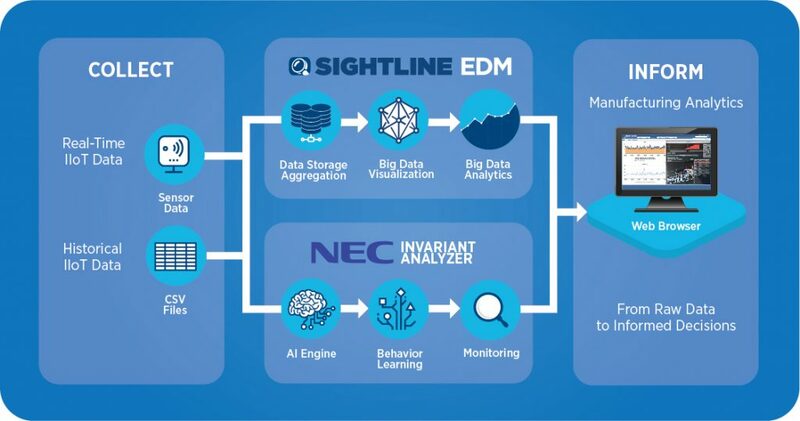 The joint solution integrates the real-time big data analytics and visualization capabilities of Sightline’s Enterprise Data Manager (EDM) with the advanced AI engine of NEC’s Invariant Analyzer to help address manufacturers’ increased demand for digital transformation to streamline operations, reduce downtime and increase profitability. Sightline EDM leverages predictive analytics and machine learning to help manufacturers continuously analyze vast quantities of smart sensor data — such as temperature, weight, time stamps, etc. — to identify subtle fluctuations in plant processes in real time to maintain production quality and decrease equipment failure. NEC’s Invariant Analyzer AI engine further helps manufacturers discover potential performance issues earlier by automatically learning system behaviors and detecting unusual activities, which increases the efficiency of computer systems and plant lifecycles and leads to enhanced performance and capacity management throughout the factory floor. About Sightline Systems Japan K.K.